Blouse fashion has been always based on the latest Bollywood (Indian) fashion trends. Blouse is one of the essential garments that is worn along with Saree. The blouse or choli today has gained equal status with the sari though it is made of a cloth of one sixth (1/6) length of sari. 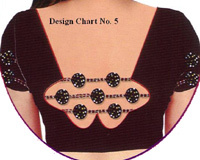 Like different patterns of Sarees, Blouses also have different patterns. It may major or minor or total changes in its shoulders, necks, tie up necklines, boat necks, deep neck, high neck, V-neck, round neck, some are backless noodle straps, backless, front open, back open, side open and so on. The back of blouse gets more prominence than it’s front as most of the front portion of blouse is covered by the sari.. . A perfect fit with matching colour blouse will add a touch of class to any sari and give a classy look. Fabrics like cotton, silk, satin, georgette, crepe etc are good options for a designer blouse. Designer blouse is the hottest raging fashion of the day.